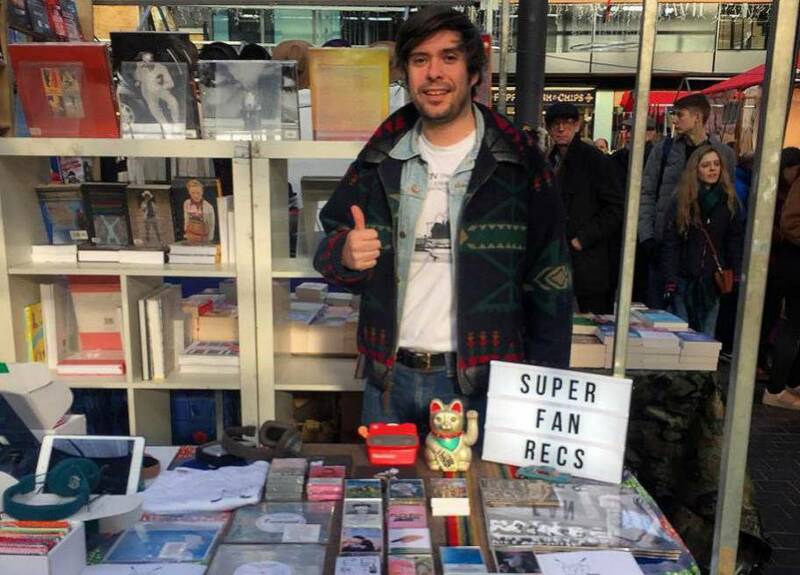 The unstoppable proliferation of London’s latest micro imprint on the rise—Super Fan 99. In welcoming you to 2017, we would like to point your attention to a very important independent imprint on the rise called Super Fan 99 Records that premieres the following teaser video to give the world a taste of what’s in store from the London label. And like the international DIY leanings heard on the rosters from fellow friends at Beech Coma, Atelier Ciseaux, beko disques & so forth; Super Fan 99 has set itself to be the imprint that springboards artists & bands to the center spotlight before the big industry conglomerates & mega-buck corporate music magazines & big-time payola publications begin their messianic-esque proselytizing over the latest trending product-churning, hit-making machines of demographic zoned/sanctioned departments of commerce-in conjunction with all the lucrative advertisement licensing you can stomach. Super Fan 99 exists to champion the talents that label operator Luke Barham (also known under the musical moniker as the cool Uncle Luc) & friends adore like Alessi, free cake for every creature, Sugar Candy Mountain, Cotillon, etc—and now with 2016 in the rear-view mirror, the new year of 2017 is about to be full of excitement to follow from Queens of Jeans, The Madcaps, Patsy’s Rats, Navy Gangs, Fletcher Johnson & still so much more. We present the official Super Fan 99 introduction to what is about to be the best year ever from London label with the video titled “SF99 RULES O.K” soundtracked by the labels own wild ones by Murph & The Gazorpos with the rug ripping, floorboard-blasting “You Did It”. This is the sound & look of the label that could be your life with artists you admire to no end. Although the independent London label began back in 2014, we first became absolutely smitten by Super Fan 99 with the massive, world shaking single “Never Lonely” from Boston based Space Mountain. Featuring a guest vocal from Ava Trilling of Forth Wanderers, the affections & intricate outpouring from the perspective of a dutiful & devout housewife paints a portrait of icy & isolated roles where the chill of vacuous sadness engulfs the track in something of a tragic beauty. The duet between Ava & Space Mountain’s principle artist Cole Kinsler builds toward the song’s climactic apex in pained-passions that almost breaks the wintry ice spell with the “saw a friend today and I feel okay…she’s in my head I’m never lonely…sings me to sleep, deeper our creep…” This completes the full song-story arc that begins with descriptions of the stoic & cold antagonist of affection (see Trilling’s striking opening lines of “my man, so mean, handsome as could be, his days aren’t meek and I’m what he needs”) that finds some kind of validation in another opposite other. Further fascinations from Kinsler & friends abound on the beloved album Big Sky released via Super Fan 99/Dust Etc where Cole & co. reach out to seek answers & splendors from something beyond the great beyond. Catching up with Super Fan 99 label boss Luke Barham, aka Uncle Luc; press photo courtesy of the artist/label. Upon viewing the 2017 video teaser for what’s in store from Super Fan 99, we caught up with founder/operator Luke Barham to discuss the future, present & past of one of the world’s best & fresh labels around. First off, describe for us what 2016 was like for you running Super Fan 99, with all the accomplishments & struggles that go into running an independent imprint? 2016 was the best year yet for Super Fan particularly the day we released both Navy Gangs and Murph & The Gazorpos. They sold so quickly with many people buying both. That’s really cool as I like to think I’m building a label with a fanbase that trust me and are interested in whatever we put out and not just one particular release. I guess as it’s grown it gets a little harder to deal with mail orders but it’s a good problem to have. Like a lot of small labels I also have a day job so end up spending a lot of my own time outside of work running the label. I’ve also been directing videos for artists on the label too. I did four this year including one for a band on Lame-O Records (The Pooches) so that has been a rewarding experience. I like it as it means I get to know the artists beyond just putting their record out, we work creatively on the visual aspect of how they are presented. It was great to see those videos I made premiered on sites like Clash, Gold Flake Paint and The Line of Best Fit as well as your good selves at Impose. Navy Gangs; press photo courtesy of the band. What do you feel that you have learned thus far since when you first started out in 2014? I think I’m more patient now for people to recognize a records qualities. Some releases have been quiet in terms of sites picking up on them or sales but I trust in the choices of artist I put out and almost every time they have eventually come good and the world has caught up. It was brilliant to see so many of the releases end up in peoples end of year lists. I don’t fret any more like I used to when people aren’t writing about our releases, I trust in what I do and if at the end of the day it’s only me who truly digs it then that’s fine. I don’t put out any bands to purely make money, I try and stay true to my taste even if I have a feeling it won’t sell loads. I’m trying to build an identity across many releases so people can say “I like everything about Super Fan” I want it to be an open door club that everyone is welcome at and feels great hanging out in. Cole Kinsler of Space Mountain; press photo courtesy of Super Fan 99/Dust Etc. A few standouts from the year? It’s hard to pick a favorite but when I first heard “Never Lonely” by Space Mountain it hit me instantly both lyrically and melodically. It’s just a perfect song. I loved working on the Queen of Jeans EP right back in January as it was the first video I’d directed and we just got so much good press and radio play. They are delightful to work with and there seems to be so much good will towards them in Philly. Doing a heart shaped vinyl for Dante Elephante was neat for our 30th release, they sold out in about 2 hours and I directed a video for that too. Queens of Jeans; press photo courtesy of Super Fan 99. A few slept on gems of great promise that rest of the world needs to know about? Although it sold out really quick it didn’t feel like Murph & The Gazorpos got enough love. They make the most authentic late 70s power-pop in the UK. I rarely find any bands I like in the UK but there seems to be this pocket of great bands in Falmouth of all places. Charlie (of the Gazorpos) plays in a few bands down there and is a real talent. Look out for his new band Holiday Ghosts in 2017! I’m hoping to make a short film about the scene in Falmouth as my Dad is from there so I find it really interesting. Sugar Candy Mountain’s album ‘666’ is another that I think is just superb and more people need to hear. They are a husband and wife band from Joshua Tree who make staggeringly good psych-pop. Alright…..tell us all the exciting stuff from Alessi, free cake for every creature, Navy Gangs, Murph & the Gazorpos, Fletcher C. Johnson, Space Mountain & more arriving in 2017 from Super Fan 99. The Alessi album is finished and should out in April/May time. Of those other bands you mentioned I believe they are all working on new records so watch this space. Cotillon and Goddam Nobody are both returning with new records around May time and Calvin Love and The Pooches join for an EP an single respectively. That’s an exclusive right there! Like the name of your imprint, I had always wanted to ask you what the year 1999 and the 90s at large means to you and the label? I grew up in the 90s so the music, art and films of that period play a huge part in what makes Super Fan what it is. The labels name is a reference to a scene in the film Swingers (1996) That, Reality Bites and Dazed and Confused were my favorite films as a teen. I loved bands like Veruca Salt, The Lemonheads and Dinosaur Jr and you totally hear that influence in some of the bands I’ve put out. What else outside of your label in 2016 caught your attention? I always keep an eye on Burger and Lolipop Records as they are consistently good. I think Sports Day is a fantastic label too, Theo keeps putting out brilliant releases. Spencer Tweedy, son of Jeff, just released a superb EP on Bandcamp and I really dig Poppies from NYC. It seems many labels don’t get beyond releases two or three so I feel pretty proud to have come this far. I’m realistic about the growth of the label so another year just like 2016 would do me just fine. It gives me great pleasure to tell the world about new music I discover so I’ll keep working hard to bring good music to peoples attention. If I’m doing a good job people will follow and things will grow. I’m going to be directing more videos and have a huge cover project I’ve been working on which is a movie related release. Hopefully that will all come together and be something unique that people will love. This one is out of my hands but I hope my team Fulham FC can gain promotion back to the premier league where they belong. Discover more via Super Fan 99 Records.